I live! Aside from the fact that my ulnar nerve in my left arm is no longer on speaking terms with me, I am doing pretty well, having finally crawled out of a depressive episode of over a month. However, I have sworn off social media for the next thirty days, so if you want to reach me, the best bet is a)texting/messaging me (I’m still using FB Messenger, even if I’m not using Facebook), b) I dunno, smoke signals? I decided to try this social media sabbatical on somewhat of a lark, but I’m finding it delightful not to feel like I have the universe yelling in my ear all the time. I may never come back! (And yes, I’m still crossposting to social media. If you want to reply to something from this post, your best bet is commenting here, because I sure won’t see it otherwise). To be frank, I shouldn’t underplay the problem with my left arm. My pinkie and ring finger have been numb for three weeks now. I’m scheduled to see an orthopedic surgeon tomorrow, and to have a nerve conduction study with a physiatrist next month, but in the meantime I have no relief. I try to stay positive, but my work involves typing, and my hobbies generally do, too, so it’s exceptionally hard not being able to do what I want. In the meantime, here’s what I’ve been up to this week. 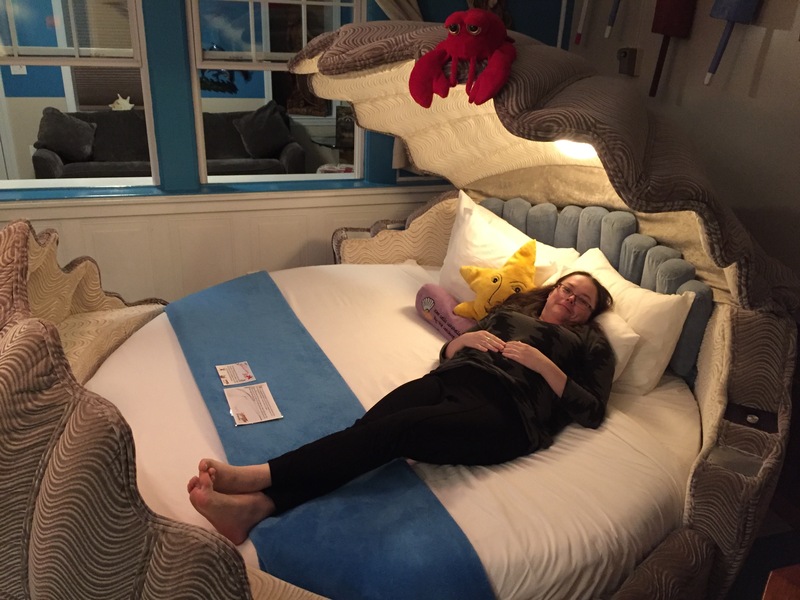 One of the highlights of this weekend’s New Hampshire adventure: a clamshell bed. God, prompt rejections are such a mixed bag (speaking from my job hunt experience). On the one hand, it’s nice not to be left hanging, and certainly I’m still more annoyed about all the places that literally *never* got back to me than I am about the ones that turned me down. On the other… jeez, quick turnaround on a no can sting. Also: Clamshell beds, part of this complete mermaid experience. Clarkesworld is great for fast rejections. At two days and a form rejection. I’m pretty sure I didn’t even get past the first readers to Neil’s desk, but oh well. I don’t think I’ve ever read a fantasy piece they’ve published, though theoretically they do… I’m slightly more hopeful with Fireside, which is where this story is right now. The bed was part of the “Deserted Island” suite. It also had an in-room jacuzzi where EB and I sat, drank wine, and watched The Muppets Take Manhattan. (Where Frank Oz decided to have the Muppets graduate from my college’s dining hall, because he thought it was the most collegiate-looking building on campus). The clam bed is very cute. Was the psychology of tattoos interesting? I find myself interested in the topic ever since I started watching Ink Master.